Let’s cut to the chase. Neck of the Woods is painfully good. 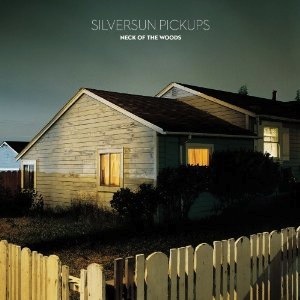 Dare we say Silversun Pickups’ best album to date? The Silverlake-based band’s third album is not the sunny Los Angeles of Carnavas, but more of an earthquake weather Los Angeles with remnants of grey overhead. Neck of the Woods harbors themes of strangeness and unfamiliarity seen in both the band’s maturation in style from the characteristic lo-fi aesthetic and personified by Brian Aubert’s lyrical content delivered with a tone of ambivalence. The most striking contrast between Neck of the Woods and the band’s previous two albums is the de-emphasis of Joe Lester’s keyboard and Aubert’s distorted guitar switching the focus to the rhythm section to create broodier undertones with Nikki Monninger’s bass lines in the forefront and Chris Guanlao’s drums heavier than ever. “The Pit” and “Dots and Dashes (Enough Already)” are perfect examples of this gloomier side of Silversun with a little post-punk sensibility worked into the arrangements. Neck of the Woods continues to carry forward the magic Silversun formula seen on Carnavas and Swoon but in a more focused and deliberate direction. Silversun devotees will be enraptured with their latest effort.